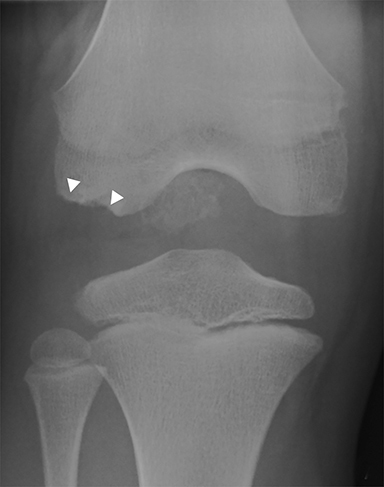 Radiographs are the mainstay of pediatric musculoskeletal imaging, making up the majority of imaging exams due to their low cost and minimal risk with regard to radiation exposure.1,2 Many pediatric fractures, particularly toddlers’ fractures and buckle fractures, are only seen on one view, rendering orthogonal projections essential. Computed tomography (CT) is best used for detailed fracture analysis to help guide management. Magnetic resonance imaging (MRI) often provides complementary information for many different pathologies, but may require sedation, particularly in patients 6 months to 7 years of age. In this article, we review common pediatric musculoskeletal radiology abnormalities the radiologist may be tasked with assessing, using an anatomic approach. In order to diagnose pediatric elbow fractures, it is essential to know the order in which the ossification centers about the elbow first appear. The mnemonic “CRITOE” (Capitellum, Radial head, Internal (medial) epicondyle, Trochlea, Olecranon and External (lateral) epicondyle) can help diagnose certain fractures, particularly those where an ossification center ‘appears’ out of the expected order. The ossification centers can look very irregular and fragmented as they are developing, particularly the olecranon and trochlea. It is important to note that the fusion of these ossification centers may not take place in this same order in which they appear. The most common type of pediatric elbow fracture is the supracondylar fracture (Figure 1), accounting for 50-75% of all elbow fractures. It is typically seen in children 3-10 years old and occurs in FOOSH (fall on outstretched hand) injuries where the olecranon acts as the fulcrum. Approximately 10-20% of these fractures present with neurovascular compromise. The fracture line is not always evident, making alignment, as evaluated with the anterior humeral line and the radiocapitellar line, important. The anterior humeral line, drawn along the anterior humeral diaphyseal cortex, should normally bisect the middle third of the capitellum in children older than 2.5 years.6 The radiocapitellar line, a line through the radial head and neck, should normally bisect the capitellum on all views.6 The presence of an elbow effusion is also helpful in detecting radiographically occult fractures, and if clinical concern warrants, immobilization and repeat radiographs in 10-14 days may be useful. Lateral condylar fractures are the second most common elbow fracture in children, accounting for 10-15% of fractures, typically occurring in children ages 6-10 years with a varus force on a supinated elbow. 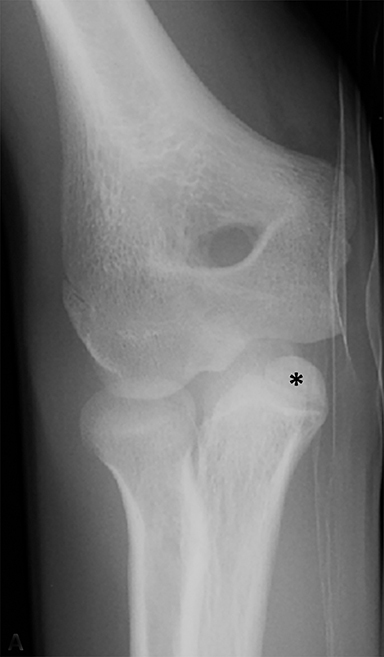 This fracture is intra-articular and displacement is important to recognize, specifically because it is often treated with open reduction and pinning. The mnemonic “CRITOE” is helpful in detecting this type of fracture, as the lateral epicondyle is the last ossification center to appear, and if seen before any of the other ossification centers, concern for a fracture is raised. Medial epicondyle avulsion fractures account for approximately 10% of pediatric elbow fractures, usually ages 7-15 years.6 They are caused by valgus stress on the elbow and associated with elbow dislocations in one third to one half of cases. 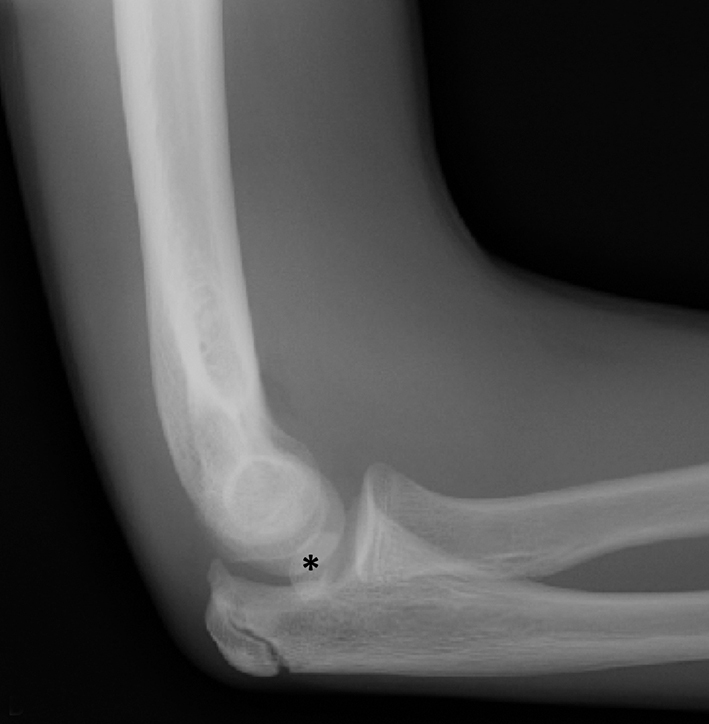 The mnemonic “CRITOE” is particularly helpful in diagnosing this type of elbow fracture, as the avulsed medial epicondyle may mimic the developing trochlea. However, based on “CRITOE”, one would expect appearance of the medial epicondyle (in normal position) prior to the appearance of the trochlear ossification center (Figure 2). 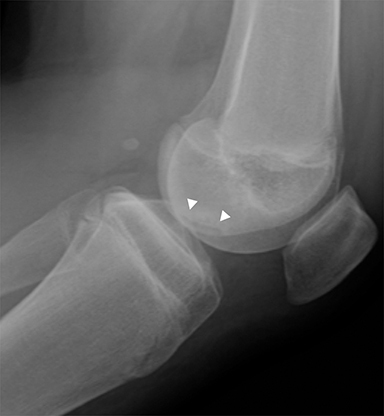 Legg-Calve-Perthes is idiopathic osteonecrosis of the immature femoral head and is a diagnosis of exclusion after considering other causes of pediatric avascular necrosis including sickle cell disease, steroids, and prior trauma. It commonly occurs in children 5-6 years old, is 5 times more common in boys and unilateral in 85-90% of cases.13 Early radiographic findings include hip effusion and lateral subluxation, fragmentation, sclerosis and flattening of the femoral epiphysis (Figure 5). This can progress to lateral extrusion of a portion of the femoral head and metaphyseal irregularity with underlying cystic change. Late radiographic findings include coxa plana, coxa magna and growth disturbances. Additional findings on MR include decreased or absent enhancement, low T1 signal of the subchondral bone, and thickening of the cartilage overlying the flattened femoral head. MR is also useful in defining the percentage of femoral head involvement, which is the basis of the Catterall classification system and one of the most important factors in predicting outcome.16,17 Approximately 60-70% of cases heal spontaneously without functional impairment, but it can lead to labral and cartilage damage as well as osteoarthritis. Slipped Capital Femoral Epiphysis (SCFE) is a Salter-Harris type I fracture through the proximal femoral physis caused by shear stress. It most commonly affects overweight children, girls 11-12 years old and boys 13-14 years old. It is seen more commonly in males (2.5:1) and is bilateral in approximately one-third of cases.18 Radiographs are the mainstay of diagnosis, with the frog-lateral being more sensitive than AP (Figure 6). 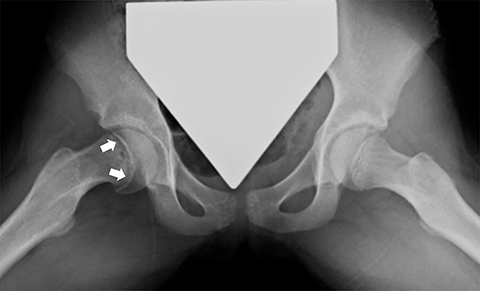 Findings include mild widening and irregularity of the physis in the most subtle of cases and slippage of the epiphysis posteromedially in later stages. 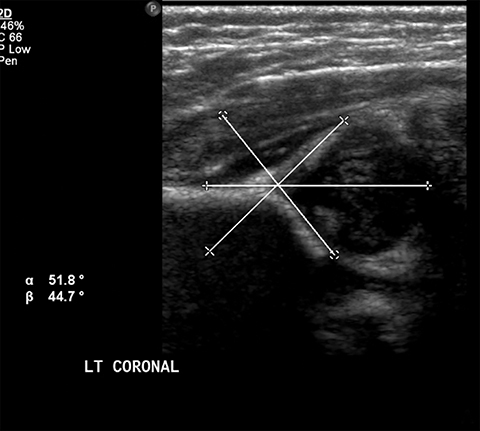 Klein’s line, a line drawn parallel to the lateral femoral neck, can be helpful in diagnosing SCFE in that it should intersect the femoral epiphysis in a normal hip but often does not with SCFE. MR may be helpful in early cases, showing physeal widening and periphyseal marrow edema prior to the femoral head slipping. SCFE is treated surgically with in situ pinning due to the risk of increased displacement and avascular necrosis. 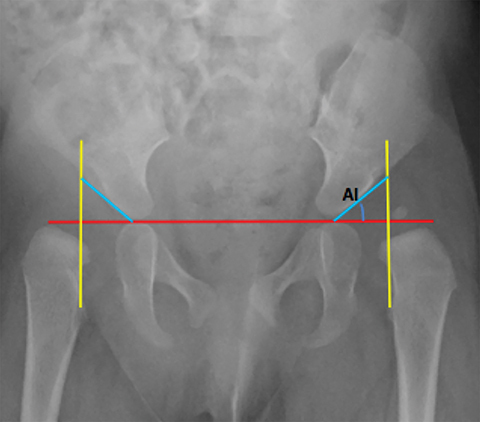 Trying to realign the femoral head to a normal position prior to pinning increases the risk of avascular necrosis, so is usually reserved for severe cases.18 Other complications include femoral acetabular impingement and chondrolysis, for which MR is often useful in detecting. Osgood-Schlatter disease is a chronic avulsion or overuse injury involving the patellar tendon insertion on the tibial tubercle, that results in inflammation, reactive bone formation, marrow edema, patellar tendon thickening and soft tissue swelling. 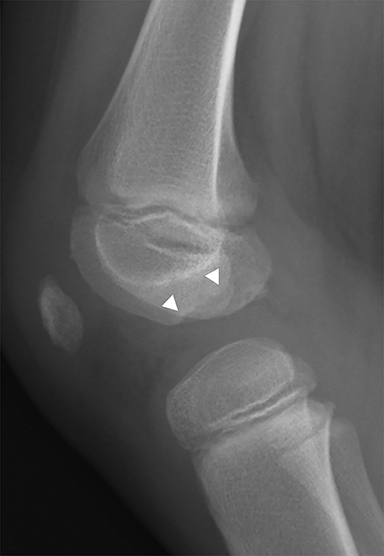 Fragmentation of the tibial tubercle on pediatric knee radiographs is commonly seen with Osgood-Schlatter disease but may also be a normal variant. 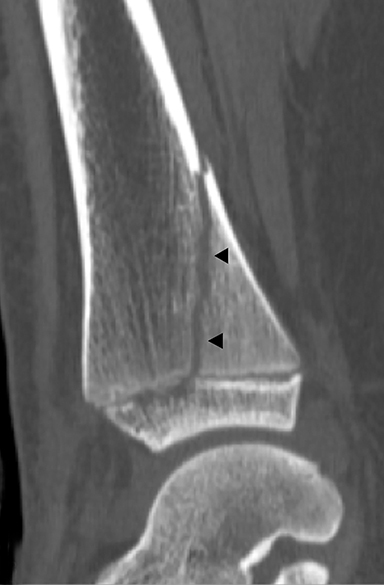 Only when there are clinical symptoms or additional radiographic findings such as patellar tendon thickening or soft tissue swelling is the diagnosis invoked.23 Osgood-Schlatter disease is bilateral in 25-50% of cases and typically affects young teenagers as the tubercle matures.19 Although it is a clinical diagnosis, MRI can be helpful in evaluating for marrow edema in very early cases. Pediatric patients manifest many unique skeletal injuries. Similar mechanisms of injury may present differently depending on skeletal maturity, with many injuries distinctly different than those seen in adults. Knowledge of these unique pathologies and anatomic variants will help the radiologist recognize these entities sooner, ultimately helping facilitate the most expeditious and appropriate care. World Health Organization. Communicating Radiation Risks in Paediatric Imaging: Information to Support Healthcare Discussions about Benefit and Risk. ; 2016. http://apps.who.int/iris/bitstream/10665/205033/1/9789241510349_eng.pdf?ua=1. Radiological Society of North America (RSNA), American College of Radiology (ACR). Patient Safety - Radiation Dose in X-Ray and CT Exams. https://www.radiologyinfo.org/en/info.cfm?pg=safety-xray. Accessed February 27, 2018. Wuerz TH, Gurd DP. Pediatric physeal ankle fracture. J Am Acad Orthop Surg. 2013;21(4):234-244. Andrew Sonin DGB. Physeal Injury (Salter-Harris Fracture). STATdx. https://my.statdx.com/document/physeal-injury-salter-harris-fract-/be07596a-490d-41a3-980d-f428937443b2? searchTerm=Salter-Harris%20Fractures,%20Ankle. Accessed December 12, 2017. Rogers LF, Poznanski AK. Imaging of epiphyseal injuries. Radiology. 1994;191(2):297-308. Iyer RS, Thapa MM, Khanna PC, et al. 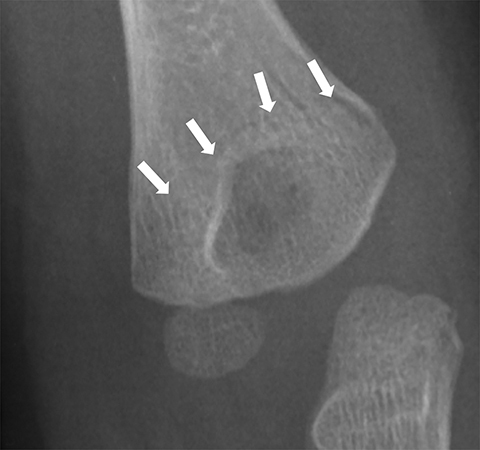 Pediatric bone imaging: imaging elbow trauma in children--a review of acute and chronic injuries. AJR Am J Roentgenol. 2012;198(5):1053-1068. Primavesi R. Sticks and stones and broken bones: distal radius fractures in children. Can Fam Physician. 2011;57(1):45-46. Little JT, Klionsky NB, Chaturvedi A, et al. 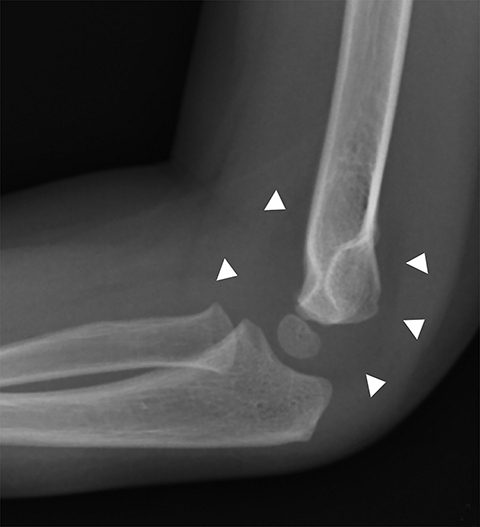 Pediatric distal forearm and wrist injury: an imaging review. Radiographics. 2014;34(2):472-490. Swischuk LE, Hernandez JA. Frequently missed fractures in children (value of comparative views). Emerg Radiol. 2004;11(1):22-28. Swischuk LE. What is different in children? Semin Musculoskelet Radiol. 2013;17(4):359-370. Ben-Yakov M, Boutis K. Buckle fractures of the distal radius in children. CMAJ. 2016;188(7):527. Paz DA, Chang GH, Yetto JM Jr, et al. Upper extremity overuse injuries in pediatric athletes: clinical presentation, imaging findings, and treatment. Clin Imaging. 2015;39(6):954-964. Zucker EJ, Lee EY, Restrepo R, et al. Hip disorders in children. AJR Am J Roentgenol. 2013;201(6):W776-W796. Rosenfeld SB. 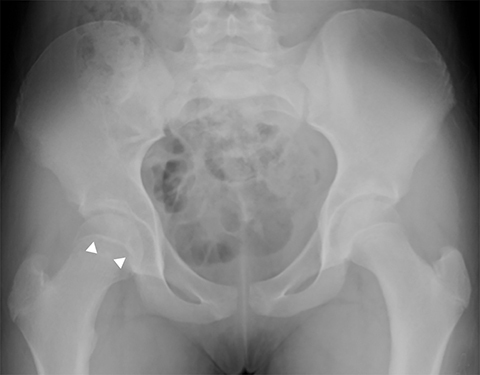 Developmental dysplasia of the hip: Clinical features and diagnosis. UpToDate. https://www.uptodate.com/contents/developmental-dysplasia-of-the-hip-clinical-features-and-diagnosis?sectionName=Plain%20radiographs&anchor=H16&source=see_link. Published July 13, 2017. Accessed January 9, 2018. Peled E, Eidelman M, Katzman A, et al. Neonatal incidence of hip dysplasia: ten years of experience. Clin Orthop Relat Res. 2008;466(4):771-775. Heesakkers N, van Kempen R, Feith R, et al. The long-term prognosis of Legg-Calvé-Perthes disease: a historical prospective study with a median follow-up of forty one years. Int Orthop. 2015;39(5):859-863. Manaster BJ. 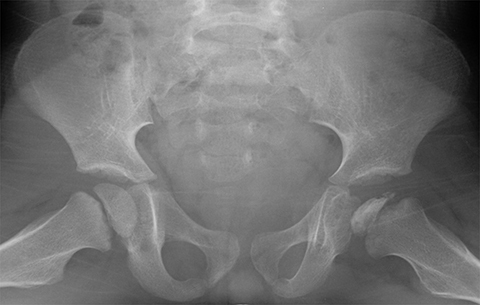 Legg-Calvé-Perthes Disease. STATdx. https://my.statdx.com/document/legg-calv-perthes-disease/c63e3da7-0d62-4cc9-bae8-42f715fc32a4?searchTerm=perthes. Accessed January 9, 2018. Manaster BJ. Slipped Capital Femoral Epiphysis. STATdx. https://my.statdx.com/document/slipped-capital-femoral-epiphysis/e62419c7-a839-4212-95a1-15ab44d308b6?searchTerm=scfe. Accessed January 9, 2018. Pai DR, Strouse PJ. MRI of the pediatric knee. AJR Am J Roentgenol. 2011;196(5):1019-1027. Gottsegen CJ, Eyer BA, White EA, et al. 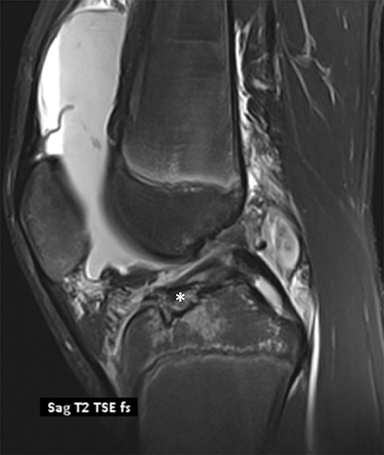 Avulsion fractures of the knee: imaging findings and clinical significance. Radiographics. 2008;28(6):1755-1770. Oeppen RS, Connolly SA, Bencardino JT, et al. Acute injury of the articular cartilage and subchondral bone: a common but unrecognized lesion in the immature knee. AJR Am J Roentgenol. 2004;182(1):111-117. De Smet AA, Ilahi OA, Graf BK. Untreated osteochondritis dissecans of the femoral condyles: prediction of patient outcome using radiographic and MR findings. Skeletal Radiol. 1997;26(8):463-467. Jans LBO, Jaremko JL, Ditchfield M, et al. Evolution of femoral condylar ossification at MR imaging: frequency and patient age distribution. Radiology. 2011;258(3):880-888. Dupuis CS, Westra SJ, Makris J, et al. Injuries and conditions of the extensor mechanism of the pediatric knee. Radiographics. 2009;29(3):877-886. John SD, Moorthy CS, Swischuk LE. Expanding the concept of the toddler’s fracture. Radiographics. 1997;17(2):367-376. 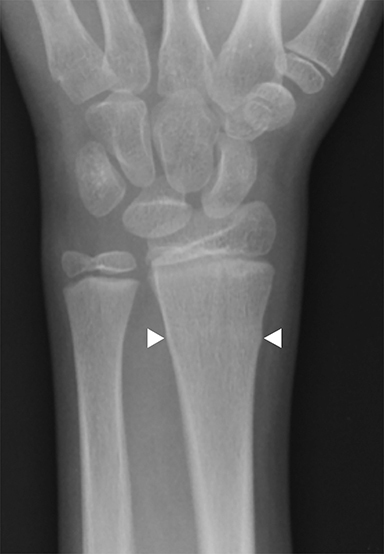 Toddler’s fracture images, diagnosis, treatment options, answer review — Pediatric Radiology. https://www.pedsradiology.com/Historyanswer.aspx?qid=33&fid=1. Accessed January 31, 2018. 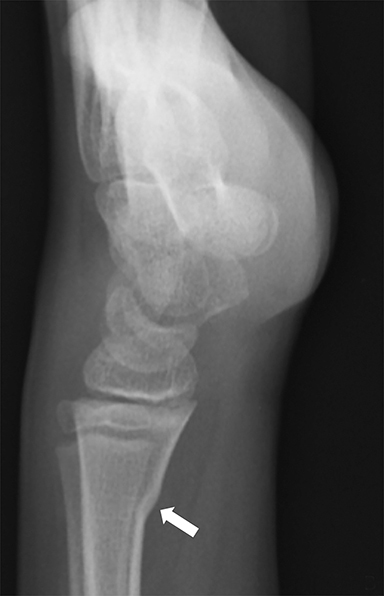 Starshak RJ, Simons GW, Sty JR. Occult fracture of the calcaneus — another toddler’s fracture. Pediatr Radiol. 1984;14(1):37-40. Blumberg K, Patterson RJ. The toddler’s cuboid fracture. Radiology. 1991;179(1):93-94. Cheema JI, Grissom LE, Harcke HT. 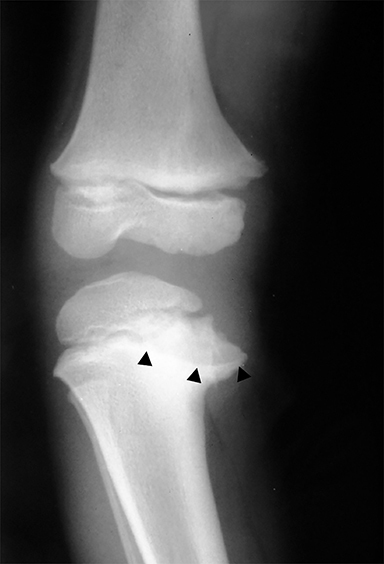 Radiographic characteristics of lower-extremity bowing in children. Radiographics. 2003;23(4):871-880. Coley BD. Caffey’s Pediatric Diagnostic Imaging. Philadelphia: Elsevier Saunders; 2013. Souder C. Infantile Blount’s Disease (tibia vara). Orthobullets. https://www.orthobullets.com/pediatrics/4050/infantile-blounts-disease-tibia-vara. Accessed February 27, 2018. Blount Disease: Background, Anatomy, Pathophysiology. https://emedicine.medscape.com/article/1250420-overview. Published October 30, 2017. Accessed February 27, 2018. Gill KG, Nemeth BA, Davis KW. Magnetic resonance imaging of the pediatric knee. Magn Reson Imaging Clin N Am. 2014;22(4):743-763. Crawford AH. Triplane and Tillaux fractures: is a 2 mm residual gap acceptable? J Pediatr Orthop. 2012;32 Suppl 1:S69-S73. 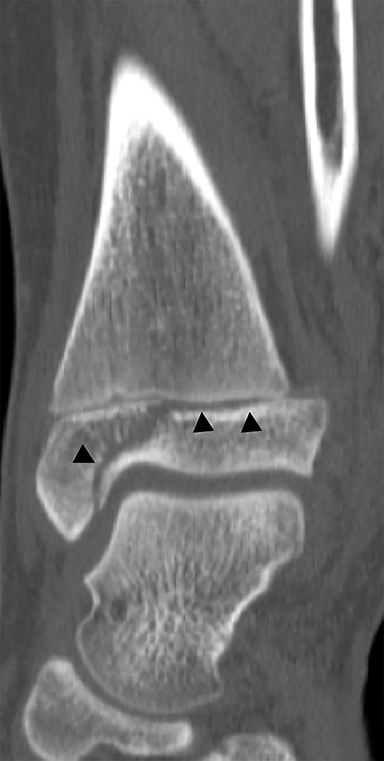 Schnetzler KA, Hoernschemeyer D. The pediatric triplane ankle fracture. J Am Acad Orthop Surg. 2007;15(12):738-747. Tanaka M, Shibano K, Tagawa Y, et al. Juvenile Tillaux fracture with disrupted anteroinferior tibiofibular ligament: A case report. Knee Surg Sports Traumatol Arthrosc. 2009;17(10):1239-1242. Ngo JS, Schooler GR. Musculoskeletal imaging in children: What the general radiologist should know. Appl Radiol. 2019;48(2):7-14. Dr. Ngo and Dr. Schooler are Radiologists at Duke University Medical Center, Durham, NC. Disclosures: None.